Countries across Europe will need to increase their rate of building retrofitting by up to 240%, starting next year to get on track to meet EU 2030 energy efficiency goals. The scope of this ambition is amplified by the fact that social housing makes up a substantial portion of the buildings in need of retrofit. To learn how to address these challenges, 150 policy-makers, planners, academics and stakeholders participated in Social Green’s mid-term conference at Casa da Música in Porto, Portugal 26 March 2019. 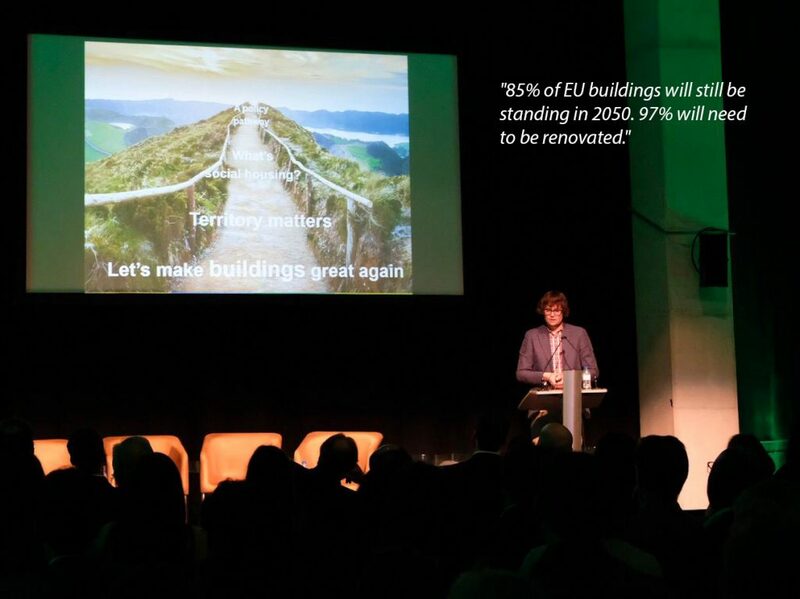 Ryan Weber, Social Green project coordinator placed specific focus on the need to use EU funding to leverage private investment in building retrofits and to develop the skills and capacities for local actors who are ultimately transforming policy into action. Pedro Móia, CCDR partner, described the regional context for social housing, emphasizing that when it comes to retrofitting social housing across Europe, one size does not fit all. He noted that in Norte, Portugal, improving residents quality of life and the quality of the urban environment must be considered in concert with energy efficiency improvements to social housing. Four experts, shared their insights during keynote presentations. Vasco Freitas, professor at Porto University, highlighted the mismatch between intended building performance and resident experience, proposing a “Passive Comfort Index” to measure resident experience within buildings. Sorcha Edwards, Secretary General of Housing Europe, noted that 4 out of 10 Europeans are overburdened by the cost of housing and that this can lead to an array of negative health outcomes. She emphasized that resident comfort is central to advancing building energy efficiency goals. Paula Rey Garcia, head of buildings and finance for DG ENER, described how support for energy efficiency in buildings will mainly occur through the development of national renovation strategies for buildings. Moving forward, she emphasized EU focus on least-developed regions when it comes energy efficiency in buildings. Radoslav Liptak, DG REGIO, detailed the move towards streamlined policy to EU funding for building renovation. In pursuing this approach, EU ambition is to make it easier for authorities to access funding for improving energy efficiency in buildings. Looking forward, it appears that the structure for accessing cohesion funding will remain as is, while countries will need to develop national renovation strategies. What remains to be seen is whether countries and their regions can develop innovative policies such as financial instruments. A priority on buildings will not come from the EU. This focus and a shift towards demand will need to come from be up to regions and their countries. The event is also a celebration marking the end of phase 1 of the Interreg Europe Social Green project. Projects local and regional partners have finalised their actions plans for policies and investment projects to improve the energy efficiency, livability and well-being of their local social housing. Looking ahead, each partner will implement their action plans over the next two years and the project will monitor progress and share common challenges and achievements. Social green Project “Regional Policies towards Greening the Social Housing Sector” is oriented to jointly tackling the topic of housing deprivation and energy efficiency in the scope of social housing sector towards a lower carbon economy. In this context the overall objective of the project is to improve regional policy instruments targeting the link between social housing sector and fuel poverty with green building interventions considering policy, institutional, financial and technical levels.